It’s clear that not enough has changed to stamp out racism in football in this time, and it’s not just an ‘international issue’. It begins at home with UK fans. Sterling’s experience at Stamford Bridge is one of many examples of racism across UK football. Racist abuse in football is present, and sadly, expected, yet the expressions of outrage and outcry for tougher sanctions aren’t being heard. UEFA takes months to serve a penalty, or decide an appropriate outcome for international games, and the general consensus is that fines are so small, clubs and teams barely notice them. For things to change, statements and decisions need be quick and have impact, whilst the event is at the top of the news agenda. Moreover, the diversity debate isn’t solely linked to race. We’ve seen cultural jibes between Serbia and Hungary on multiple occasions and with roughly 2% of the nation identifying as LGB (that’s about 1 in 50), I’m dubious there isn’t a premier league player who is gay, or bisexual. The numbers don’t stack up, suggesting football isn’t the environment where players feel able to talk about their sexuality. 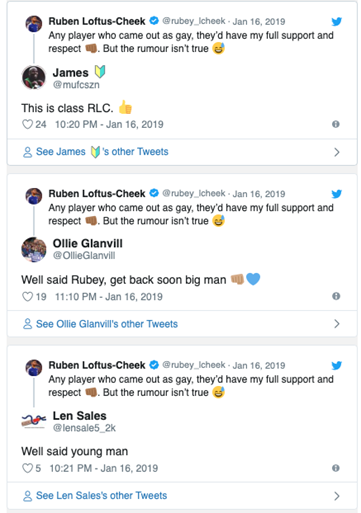 The recent response to a statement from Lotus-Cheek amid rumours implies fans and players could think that too. So, what more can be done to challenge these out-dated attitudes? Nike’s ‘Stand Up, Speak Up’ campaign was launched in 2005 by Thierry Henry to help put a stop to racism in football. Fast forward 14 years, fans, teams, as well as brands are actively calling out abusive behaviour, yet we’re not seeing less of it. Harry Kane has vowed to walk the England squad off the pitch if another international match is marred by racial abuse, but why stop there? Shouldn’t every Captain walk their team off if their players face abuse, whether at Stamford Bridge, Anfield or Fratton Park? And it shouldn’t stop at the players. Fans must also get involved to tackle this. With stands half-empty, those with the power to enforce harder rules and penalties will surely think twice and act.